The BBC is guilty of "fawning" in its coverage of the Royal Family, Newsnight presenter Jeremy Paxman has claimed. Speaking on Radio 4's The Palace and the Beeb, to be aired later this week, he said the BBC was unsure whether to "celebrate" or report big royal events. The presenter added there was "a fawning sense to the tone of voice it [the BBC] adopts when dealing with the heir to the throne and his family". A BBC spokeswoman said Paxman was "one of many voices" on the programme. Paxman said he had come to his conclusions while researching his book On Royalty. "While the BBC does report royal matters pretty straightforwardly, as it should, there is still a fawning taste, a fawning sense to the tone of voice it adopts when dealing with the heir to throne and his family," he said. "They do not treat them in the way they would treat other members of the public, to which it might equally reply that they are not other members of the public." He also claimed the BBC had not known how to handle the death of the Queen Mother in 2002. "It was unclear whether the BBC was announcing this as a piece of news or in its capacity as mourner-in-chief, really, and it got into a terrible muddle," he said. 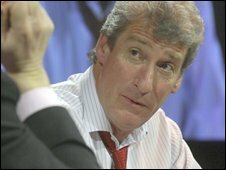 Paxman, no stranger to controversy, said in August that middle-class white men were discriminated against in TV and that any such man wanting to work in the industry should "give up all hope". Broadcaster Mariella Frostrup dismissed his comments and cited a number of presenters who fitted the description - including Jonathan Ross and Paxman himself. Also in August, he upset Scots by calling the work of Robert Burns "sentimental doggerel". And at last year's Edinburgh TV Festival he criticised the licence fee as a tax on the ownership of television which he said was 50 years out of date.